WASHINGTON HEIGHTS — One of the few remaining Irish bars in an area once known as a Gaelic stronghold with plentiful pubs closed last week after half a century. 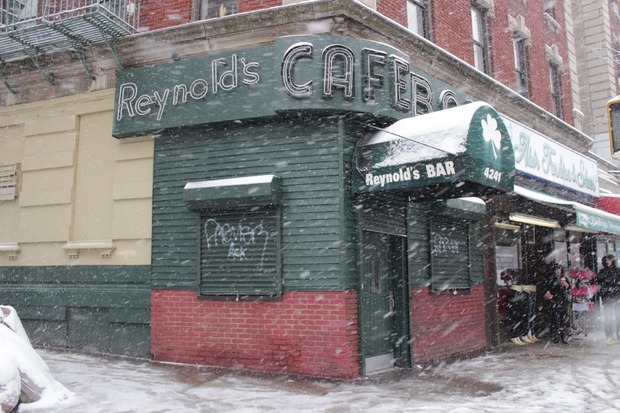 Reynold’s Café, at the corner of Broadway and 180th Street, shut its doors for good Sunday despite applying for a liquor license renewal just last month. On Thursday morning, a maintenance worker for the building's manager was busy clearing out odds and ends from the bar. A spokeswoman from the management company, Stellar Management, confirmed the bar had shuttered for good and that the space would become home to a new retail location. “It's unfortunate they moved out, [but] they did not leave because of a rent hike," the spokeswoman said. "We hope to lease the currently available corner space at 4241 Broadway to a retail tenant who will add to the continually improving neighborhood." Records from Community Board 12 show that Reynold's manager, Patrick Smith, appeared before the board’s licensing committee in February to renew the bar’s liquor license. The board voted to recommend the application for approval. In response to the abrupt closure, locals raised a glass to one of the last vestiges of the thriving Irish community that once occupied Washington Heights and Inwood. “It was a step back in time,” said Dave Hunt, owner of Coogan’s Restaurant in Washington Heights. "This was the last blue-collar drinking bar in the area." Hunt said Reynold's followed what was once a tried-and-true blueprint for a good working-class bar: no kitchen, a great jukebox, reasonably priced drinks and regular customers. Hunt, who grew up in Inwood, said he'd known the bar's longtime owner Jimmy Reynolds for 50 years and described him as a total gentleman. However, Hunt said that Jimmy, who is now elderly, had not been involved in the day-to-day operations of the bar for years. Patrick McMahon has been stopping into Reynold’s a few times a week for about the last five years. He described the bar as having the feeling of a neighborhood clubhouse. He was surprised to find it closed when he went earlier this week. Neither customers nor employees received warning of the impending closure, McMahon noted. From all appearances, the bar had changed very little since it opened in the mid-1960s. An old-fashioned cash register sat behind the long wooden bar and decorations were limited to a few pieces of taxidermy and an Irish road sign. Hunt said that while the bar had stayed the same over the decades, the patrons had not.